The three hiking trails at the 106-acre Chalet Nivale Preserve on Bacon Flat Road in Adams County are open to the public every day of the year from sunrise to sunset. Sorry, pets are not allowed at Chalet Nivale nor most of the Arc’s trail systems – please see Fort Hill and Serpent Mound for pets permitted on leash. Two loop trails meander through the low floodplain created by two short tributaries of Scioto Brush Creek that have sculpted the bedrock into mossy slump blocks and intriguing outcrops, bounded by vertical cliffs. A third trail dissects a meadow that lies like a low bowl – surrounded by a rim of Appalachian hills. The trail provides pleasant panoramas of the surrounding hill country, especially during fall color season. There are several unimproved shallow stream crossings on Chalet Nivale Trails that require stepping on stones and therefore good balance. Please wear appropriate footgear and do not hike after a series of heavy rains. In normal weather the water is 2-3 inches deep.Other than these creek crossings the trails are easy to moderate in difficulty. 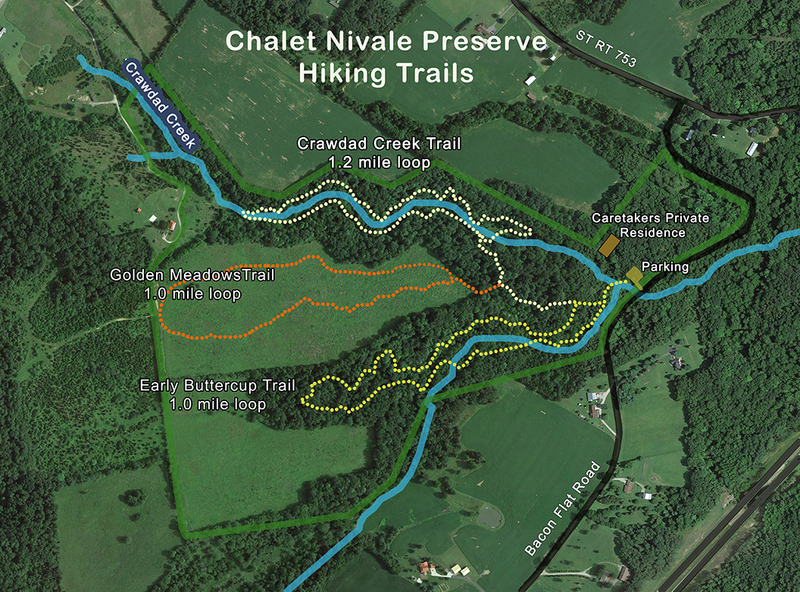 The trails follow Chalet Nivale’s gently rolling terrain – with wildflowers growing right up to trails’ edge. Please stay on trails in single file to reduce impact on dormant and actively growing wildflower bulbs. Trails may be uneven with roots and a few exposed rocks. Crawdad Creek follows a verdant dolomite stream valley bordered by 40 foot vertical rock walls. The valley is rich in spring wildflowers and very scenic geologically. Adams County forests often have a prairie influence. Therefore many interesting prairie wildflowers cling on under the shade of the canopy. The water quality of the streams rates among the cleanest headwater streams in all of Ohio. Early Buttercup Trail follows a verdant dolomite stream valley that has created a gentle valley on the western portion of the preserve – a separate stream from Crawdad Creek. This is the best trail to admire spring wildflowers in mid April, and the early showcase of the rare snow trilliums that bloom in mid to late March. The water quality of the streams rates among the cleanest headwater streams in all of Ohio, harboring a high diversity of invertebrates and fish for its small size. Golden Meadows Trail is a pleasant walk through a sunny meadow that has established itself on land that was managed as an agricultural field by the previous owner. The meadow spreads across a wide swale and affords aesthetic views of the higher elevation forests that embrace Chalet Nivale to the north.